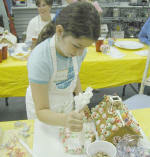 Our "Family Cooking Gingerbread House Classes"
have become an annual Oro Valley institution! Please come join us for this wonderful afternoon. Kids love the opportunity to create (and take) a masterpiece. We always have drinks and a snack. class is Saturday, December 17! One parent and one child $64. 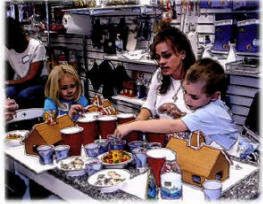 Price includes one Gingerbread House per child to decorate and take. schedule your own private group class. ORDER YOUR CUSTOM GINGERBREAD HOUSE FROM US!